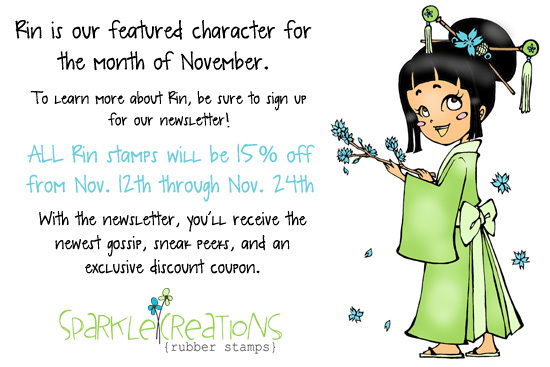 Hello and Welcome to Day 3 (the final day) of previews for the November release for Sparkle Creations Rubber Stamps! Sparkle is releasing 2 new SCRS images and 1 new Karber clear set, and they are available in the store NOW! Today we are previewing the final new SCRS image, Snow Angel Ruby! As I am typing my post, I looked back at my last couple of cards. They were both fairly clean and simple, with no patterned paper and limited embellishments. I must have subconsciously tried to make up for that while I was making this card... lol! Be sure to visit all rest of the SCRS designers for more peeks of Snow Angel Ruby. Sparkle will be giving away a Snow Angel Ruby to one lucky person! For a chance to win, you need to comment on all of the designer's blogs (list below). Then head on over to the and comment on the Ruby post. You have until midnight EST each day to comment. The lucky winner will be announced the following day! Accessories: Labels Eight Nestabilities (Spellbinders), Markers (Copic), Star Dust Stickles (Ranger), Chipboard snowflakes (Maya Road), Glimmer Mist (Tattered Angels), Frosted Red pearls, Bubble pearls (Pizzazz Aplenty); Ribbon, Button (Papertrey Ink); Twine (May Arts), Foam tape, Thread, Sewing machine. Really wonderful Steph and love the scard colouring! Stephanie, what an adorable card!! 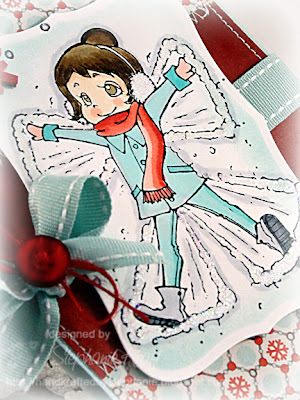 Love the colors and the snow angel image is so cute!! love it. cute new stamp! love your card too! you did a fab job on this card just stunning. Oooh! I love these gorgeous papers Stephanie and the colors are fantastic! These papers are fabulous and I love your "snow angel". The snowflakes and bow with the button and twine are perfect!!! So cute Stephanie! Love your choice of color and you did a great job coloring the sweet little angel!